Golden Retrievers are one of the most popular dog breeds in America, and with good reason! They are not only stunningly beautiful, but they have brains as well. Their friendly and gentle disposition make them a great family dog. Goldens love people of all ages, and get along well with other animals. They are simply wonderful! They are a very easygoing breed, but they do have requirements that need to be met to ensure their happiness. If you own a Golden Retriever, then you know firsthand how much joy and happiness they bring to you, so how do you return the favor to your dog? Find out in this article what you need to do to take care of a Golden Retriever. Goldens love to be with their human companions at all times. They crave human attention and affection. No amount is too much for them, they will sit by your feet and lean against you waiting for you to pet them. Some people call them “Velcro dogs”, because they are always by your side, and will follow you everywhere, even to the bathroom. They are happiest when they are with you, and they shouldn’t be left alone for long periods of time. If left alone too long they can become depressed, and often develop bad behavior such as chewing, excessive barking, and become destructive. Taking your Golden to a Doggie Day Care, or hiring a Dog Walker while you are away will certainly help, but keep in mind that you are everything to your Golden Retriever and they want to spend their time with you. When it comes to feeding your Golden, you should feed the best food you can. A high quality diet is a must for these dogs, as they can easily develop skin problems such as allergies, and they can easily become overweight. Goldens love food, and will eat anything!! It is important to keep control and monitor their food intake so that they do not become overweight. It is certainly not an easy thing to do when they look at you with their sad puppy dog eyes begging for food every time you eat. The biggest mistake you can make is feeding them from the table. I can attest to this because I used to do it! My dog became slightly overweight, and it was a struggle to shed the pounds off of her. Goldens are labeled as a medium to large sized breed, and adult Goldens will typically weigh between 55-65 lbs (female), and 65-75lbs (male). Some adults can weigh more or less depending on genetics. Because of their large size they need room to move. Goldens are not meant to be an outside dog all the time, they would rather spend time with their humans inside than be outside by themselves. Having a yard for them to run and play is beneficial, but when given enough exercise and outdoor time Goldens can also do well in apartment living. Just make sure that your house or apartment is large enough to accommodate them. One thing is for certain of this breed, and that is they shed!!! Golden Retrievers are known for their beautiful long coat, which is actually a double-coat. Meaning it consists of a thick soft undercoat, and a coarser topcoat. The undercoat is what sheds heavily in the spring and fall, and there is moderate shedding throughout the rest of the year. A Goldens double-coat offers protection from the elements, it keeps them cool in the summer and warm in the winter. A dog with a double-coat should never be shaved. Regular brushing is a must to keep their coat looking healthy and shiny, and to minimize the shedding. Bathing should be done regularly as well, and since Goldens love water it should be easier to do. Because of their floppy ears, Goldens can be prone to ear infections, and their ears should be cleaned on a regular basis as well. Golden Retrievers are beautiful, and they know it and love to show it off. It is up to their owners to keep them beautiful. Grooming a Golden Retriever does not have to be difficult, you can easily learn to groom them yourself at home to save some money. Golden Retrievers are naturally social. They love nothing more than being taken for a walk and meeting new people and other dogs. Known for their friendly and gentle nature, Goldens will get along with all animals and all people. My Golden Retriever Ellie is such a “people dog”, and because of her social nature we have met so many people in our neighborhood and on the trail we walk. She has earned the nickname ” the friendliest dog of the neighborhood”. As a puppy she would invite herself up onto peoples porches to say hi to them and get petted. Now as an adult she continues this with the people that she knows. She will also go up to strangers and sit on their feet and wait to be petted. She loves the attention that she gets. After meeting someone, or another dog she usually gets very happy and excited. It is almost like a “high” to her. I would suggest taking your Golden everywhere with you, take them to the park, for car rides, let them meet new people and dogs. Let them experience new things and you will have a happy dog. Natural born swimmers, to say that Goldens love water is an understatement! I mean I’m sure there are some Goldens that do not like water, maybe because they are not familiar with it, but most of them truly love it. Especially on a hot summer day Goldens will love to go in any water source they can find. Whether it’s a creek, a lake or a pool, they will jump in and cool off. Some owners have Golden Retrievers that enjoy rolling around and getting dirty in mud puddles, I am lucky enough to not be one of those owners. Swimming is a great form of exercise for your Golden Retriever, so take them with you to a dog friendly beach or other water spot and have a game of fetch in the water. Because they are such intelligent dogs, Golden Retrievers are easy to train. They are eager to please their owner, especially when a treat is involved for being a good dog. In order to keep them from getting bored, and becoming destructive, they should be given plenty of mental stimulation. Golden Retrievers are happier and healthier, and more behaved when they are given mental stimulation on a daily basis. This can be done by teaching your dog basic commands and tricks, playing games with them, and providing enough exercise. An example of mental stimulation right now for my dog Ellie, is when we are out walking she loves to go into the creek at several spots along the trail and hunt for frogs. She is so excited when she sees one and tries to catch it. Who says that a Golden Retriever is not a lap dog! They are basically a large sized teddy bear. Craving human attention and affection is what they do and if that means jumping onto your lap and snuggling up with you, then that is what they will do. I remember when Ellie was a puppy I did not want her on the couch. I even tried to put tinfoil on the couch to deter her away from it. How long do you think that lasted?? Maybe a week or less. She would take a running leap and jump onto the couch and realize how comfortable it was, and just stay there. Nothing I could do about it, it was just easier to give in. Now I share a couch with her. She has her side, I have mine. The lifespan of a Golden Retriever is typically 10-12 years. Some Goldens may live longer. Regardless, as a Golden Retriever owner the time spent with one is never long enough. 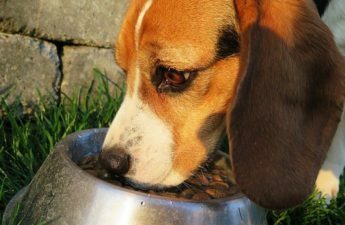 In order to keep them healthy and to ensure a long life with your devoted best friend, there are things you need to do. Provide a nutritious high quality diet. Provide plenty of exercise, and mental stimulation. Keep them at an ideal weight, watch food intake so they do not become obese. Look for any signs of illness and medical problems, and get regular vet check-ups. Play with them, and show them plenty of love. Provide regular grooming to keep them clean and healthy. Golden Retrievers make lousy guard dogs. They may bark at a stranger at the door, but will soon wag their tail and flash their friendly smile at them. They love people way too much to be effective as a guard dog. If someone were to break into their home a Golden would rather lick them to death than show any form of aggression. I believe the number one thing that any dog owner can do is to show their dog lots of love! The Golden Retriever especially needs a lot of love and attention in order to be happy. They value the time spent with you, and any dog owner knows that the time spent with their beloved Golden Retriever is never enough. A Golden Retriever quickly steals your heart and becomes your best friend. Their beauty both inside and out becomes addicting that most owners of this beautiful breed usually owns more than one. Keep in mind that if you let a Golden be a Golden, by letting them do what they love such as meeting new people and going swimming, then you will be rewarded with a happy dog. How about you? How do you take care of your Golden Retriever to ensure their happiness? I would love to hear from you, please leave me a comment below.